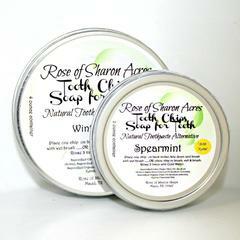 Enjoy both of our oral care products - 2 oz Tooth Chips - Soap for Teeth & our All Natural Herbal Tooth Powder and save! Tooth Powder Ingredients: Tooth Chips, Xylitol, Baking Soda, Organic White Oak Bark, Wildharvested Myrrh Gum Resin, Peppermint Leaves, Anise Seed, Organic Clove, Essential Oils. I love how the tooth chip cleans my teeth. When I get done brushing, my teeth really feels clean. I can't believe how white my toothbrush has stayed brushing with the tooth chip. The real test will be when I go for my dentist checkup next month. I used the All Natural Herbal Tooth Powder on my molars when the upper gum line felt a little sore. The soreness went away so I brush my molars with the tooth powder every once in a while. I like the fact that after you brush with the powder, you don't rinse, just spit the excess out so the powder stays on your teeth and gums. For the price, I think this is a bargain because the tooth chips alone will last me a long time.